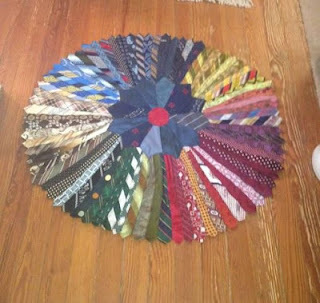 I kept working with the smaller ends of the ties and wound up with a really cute rug! I put two layers of batting where the hole in the middle was and then backed it with a really heavy muslin (also from the box of goodies!). 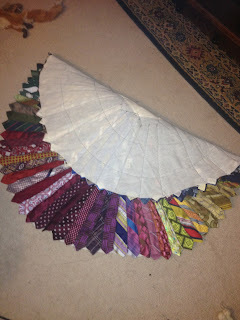 After I got it all pinned I stitched them along the tie lines and then made a big spiral out from the center to lock in all the ties. The centerpiece is made from a template technique. The ties are broken down, fused with pellon and then sewn together. I haven't really gone any farther with the bigger version of this and it may have to go on the back burner for a while. 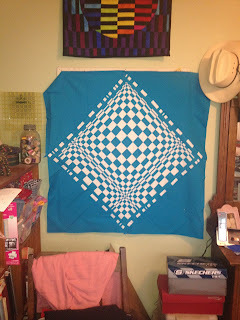 Speaking of back burner, I put my opt-art quilt on a solid backing today. I'm thinking it's too big for a wall hanging so maybe I'll border it and turn it into a quilt. The tie rug looks really interesting. Is it functional? Will it hold up or is it just for show? And I love, love, love your op art piece. I would have to have it on a wall so it could be seen. The little rug is awesome! It's totally functional and I expect it to be pretty durable because it's made from thick polyester ties, the whole tie has lots of layers and the stiffener inside. It's really quite heavy duty.